Whether you have chosen to install decking yourself, which represents a significant investment, or whether you have bought a property that came with decking, it is essential that you take care of it throughout the year to ensure its quality is maintained and it can be enjoyed at any time. However, maintaining your decking needn’t be a strenuous or time-consuming task if approached efficiently and effectively. While it may seem obvious, it is essential that you get your decking cleaned throughout the year, not just in the months you are using it. Cleaning your decking on a regular basis really is the most cost effective way of maintaining it’s longevity, and this involves cleaning all debris that falls on it, removing any mould build up and sweeping away the surface dirt. Once these have been done, it is then essential that you wash the decking down with a pressure washer to remove all dirt, debris and mould spores that have become ingrained into the wood. Often, the best way to ensure that the pressure washing has been done properly is to get a professional to do it, so you are secure in the knowledge that they will know what they are doing, and have the best equipment for the job. 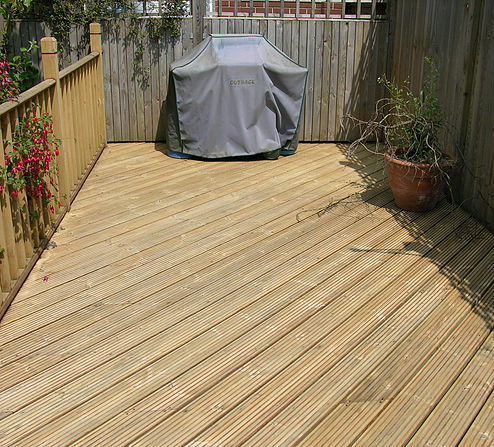 In order to keep the wood of your decking in the best possible condition, it should be protected at least once a year with decking protector, decking stain or decking oil, depending upon the type of decking you have installed. Not only will these protective solutions help to make your decking weatherproof, they will also keep the wood looking fresh, and offer an extra layer of protection against spills and stains. Whenever your decking is looking a bit worse for wear, there is a range of products available to help restore it back to its’ former glory. Ensure that the decking is cleaned thoroughly by a professional with a jet wash or power hose first, and then apply your chosen restoring product to the decking according to the manufacturer’s instructions. Often, these products need to be completely washed off after a certain amount of time, usually an hour, and it is well worth getting a professional to do this for you. At Premier Clean 2000, we pride ourselves on offering the best possible pressure washing services, driveway cleaning services, graffiti removal and chewing gum removal for both commercial and private clients. For more information about how we can help you, please contact us at https://www.premierclean2000.com/contact/.